It’s easy to be seduced by even a quick glance at Taxim’s menu. After all, Wicker Park has nothing like it. In fact, Chicago has nothing like it. It’s Greek, but it’s not—not if your idea of Greek is flaming cheese, hefty piles of gyro meat and four-finger-thick moussaka. The vision of David Schneider—who spent summers with his maternal family in Greece’s Aegean Islands—Taxim’s menu is executed by chef de cuisine Jan Rickerl, Stephanie Izard’s right-hand man at defunct seafood stunner Scylla. 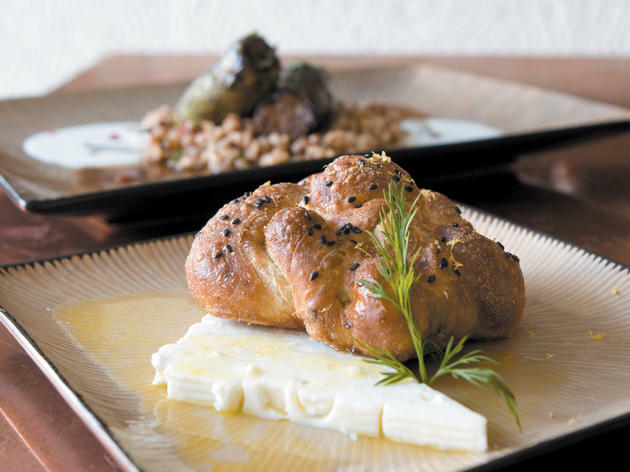 Schneider and Rickerl’s collaborative effort is dotted with dishes like rampopita, described as “ramps, green garlic, fresh dill, goat feta, house-made phyllo”; koukia me kavourma, “fresh shelled fava beans, lamb confit, house-made yogurt”; and arnaki me kapnisto pligouri, or “lamb shank braised in white wine, smoked green wheat, toasted almonds, fennel salad.” It’s seasonal, it’s enticing and it’s one hell of a buildup. So maybe that’s why the actual experience brings one back down to earth a bit. After three visits, I realized the thing to keep in mind is that while Taxim’s menu descriptions sound incredible, they do so because they’re uncommon. Knowing that each dish is exactly as described, composed of no more but no less, is key to fully enjoying the food. (It takes much less thought to enjoy the atmosphere, a setting that encourages diners to sink into ornate pillows, have that second bottle of wine and marvel at just how hot their date looks under the low glow of Byzantine-style chandeliers. Ditto for the wine list, a value-rich roster of undiscovered Greek picks.) It’s easy to have a “blink-and-you-miss-it” feeling at first bite, but with patience, you’ll see that it’s precisely Taxim’s subtleties that bring your fork back to each dish again and again. Cases in point: I needed another bite of the charcoal-roasted eggplant to appreciate the taste of briny olive oil that keeps it from being just another rendition of baba ghanoush. After a couple minutes with the sauteed baby okra, I saw how the sweetness of the sun-dried tomatoes balanced the punch of the few flecks of cilantro. Redcress leaves hiding among arugula mimicked the herbal notes in a lemon-mint vinaigrette, and the whole package was just acidic enough to cut through the salty pan-seared halloumi cheese mixed into the salad. That rampopita (pictured) appears to be little more than a poppy-seed bun, but cut into it and you’ll find that the croissant-like texture gives way to a garlicky filling of tender ramps, perfect when followed by a bite of oil-packed goat’s milk feta. The simplicity of the many mezethes, or small plates, begins to add up to something truly substantial once you’ve hit number three or four. You begin to see the distinctiveness of each and the purposefulness of their assembly. Together, they’re a sum greater than their parts. But the impatient can dive right into entrées for a straight shot of success—tender, full-flavored lamb shank falls from the bone with a gentle tug of the fork; spit-roasted duck tucked into crêpe-like pita obliterates greasy gyro associations; and a whole loup de mer is executed with incredible expertise—its skin is well-seasoned and crackly-crisp, its flesh is moist but not mushy, and its bitter dandelion salad is the perfect pair. Including the salt, olive oil and lemon that flavor the fish, there are exactly five ingredients to this dish. And it doesn’t need a single thing more. Truly an incredibly unique spot in Chicago. Beautiful indoors, great and knowledgeable service, and amazing food for any diet. this is my favorite restaurant in chicago. 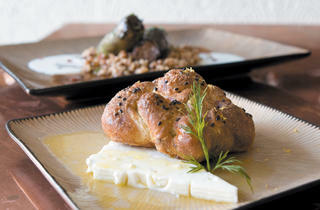 this is a truly artistic expression of Mediterranean and greek food. the design, decor, wine list, small plates. it doesn't get more flavorful, more intentional than this. I'm middle eastern, but i can say no one in my family makes baba ghanoush this good. the lamb is always tender and never gamey. the prassopita is something i can eat every single day. the wine list, forget it. greek wines are a treasure. this place, is a gem. We went here for the first time last night. This restaurant is adorable - so well designed and warm (there are all sorts of copper accents), the wait staff is very knowledgeable and the food is quite tasty. My only down side for the food is that it seemed overly oily. The wine was quite tasty - and the Greek wine list looked extensive. Overall, an excellent experience!